Think softly scented rose, reminiscent of turkish delight sweets and caramel. Reading the ingredients, I discovered that it contains a lot of goodies; shea butter, sweet almond oil, camelia seed oil, beeswax, kukui nut oil to start with as the emollients & carriers; rose otto and rose absolute are blended with rose geranium and benzoin (ahhhh, hello caramel scent! ), lavender and Roman chamomile as the main scents. This stuff smells beyond divine - it's like my own personal blended hand cream (my aromatherapist, the lovely Sandra from Apothacary 19, always uses rose, geranium and benzoin in her custom blends for me, so this hand cream is definitely a "me" product!). I also like the fact that the cream boasts "98.8% natural origin" products, at least some of which are organic, and contains no parabens, sulphates, petroleum, mineral oils, silicones or artificial colours or fragrances. Although it's not the most rich hand cream I've ever used, it certainly does the trick and then some, leaving my mitts feeling soft and smelling delicious. It cost me €14.50 (for 100ml) so it's not exactly crazily expensive either. The company does deliver, but at a tenner (sterling) for delivery to Ireland, probably a good option to use is Parcel Motel if you're not in the UK (delivery to the UK is only a fiver, which isn't bad, so Parcel Motel will work out a few quid cheaper). balance Me itself is a tiny UK company which started out when two sisters (Rebecca & Clare Hopkins) decided to re-train in more holistic fields than their business backgrounds dictated, they were joined by an aromatherapist (Sian Jones) and literally started making products from their kitchens. Seven years later, they're going from strength to strength and have won industry awards and accolades for their face and body products, and have featured in pretty much every commercial (beauty and otherwise) magazine going. 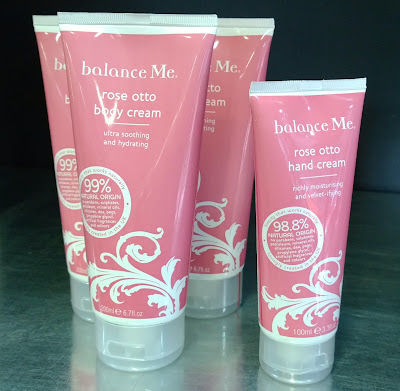 Look here if you're interested in reading more about the balance Me range of products.